Just when you that the iPhone wars was ending now that Verizon has ownership of the latest model, out comes AT&T targeting a different segment of the market to minimize business for the competition. Although both the AT&T and Verizon iPhone 4 handsets have their own unique capabilities, it seems that AT&T is falling back on last year’s model to entice would be customers. 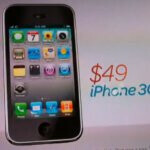 Specifically, they’re using the $49 iPhone 3GS as ammunition in their latest advertisement spot that quickly makes a point about its affordable pricing. If pricing is something that really hits the core with you, then there’s no arguing the amount of money you’d save on picking the $49 8GB iPhone 3GS – which is $150 less than the 16GB iPhone 4 and $250 less than the 32GB one. Right now, AT&T can undoubtedly use this strategy for the next few months until the next iteration of the iPhone is released – thus giving Verizon their very own inexpensive last-generation model. I dont see why this be attractive to someone. If AT&T is trying to reach the guy who can dish out an extra $100 for iphone 4 what the point in trying to sell him the 3GS if he cant afford the data plan for it. Doesnt make too much sense too as AT&T will see more customers default on their plans and thus hurt their customers which will hurt AT&T's image more. This is kind of like offering sub-prime mortgages to people who cant afford them. while i laugh at the desperation of using the 3gs, they are just taking a page from Tmobile. Tmo has been selling gargantuan amounts of the cheaper android phones to people that want the android capability but dont care about all the high end bells and wistles. The iphone4 just brings a bigger camera, better screen, and more dropped calls, other than that they do the exact same thing. Not everyone needs the ferrari, some people prefer the civics and accords. @ribbonsalmark: I can afford the monthly plan for the i-phone but I am going to buy the 3GS for $49 for my wife and I. We were considering the Verizon i-phone 4 but this is just too good a deal. We dont need Facetime and the 3GS does everything we need so yes....ATT advertising stole us from Verizon. Tomorrow we leave T-mobile and join ATT. I reiterate again, we can easily afford the monthly plan...maybe their advertising campaign is smart after all. 2 lines 69.99 + 20.00 unl messaging and unlimited msg 30.00 with free unl mobile to any mobile and 15.00/200 MB per line of data....well, not that cheap...but, then again, it is a luxury. This is a reactionary (sp) move by ATT. The iphone4 at VZW is the same as ATT but they are sacred and aware of their customers jobbing ship due to the simple fact that the network at Verizon is proven and commented on to be that much better. This ad is like Sprint with their plans but they continue to lost costomers. Yeah, anything under $250 is billable to the account. Just call in for your upgrade. You get your phone and help someone out with some comish!